Do you like listening to audios or watching video clips while traveling, exercising, or engaged in any activity? If you do, we suggest that you invest in the best MP3 player. An MP3 player lets you store audio files that you can listen through earphones and or an external audio speaker. Despite the critical role, most people encounter a challenge when trying to pick the best MP3 player from the numerous types sold. To solve the problem, our article has scrutinized 10 of the best MP3 players in the market that are compact in size, easy to use, have a big memory, and are reasonably priced. The FecPecu 8Gb MP3 Player lets you listen and watch videos, record, view pictures, and listen to an FM radio. Fecpecu’s standard package contains a USB cable for charging, smart headphones, and an easy to read manual guide. 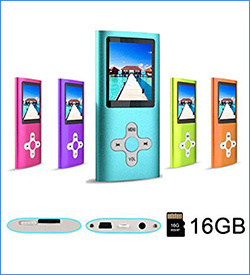 You may want to buy this FecPecu MP3 player because it comes in multiple colors and it can run for 80 hours on a single charge making it a good option for travelers. However, the MP3 lacks an AC adapter to recharge it, and it resets the date and time each time you switch it off. Best for: People who love watching videos and playing games. 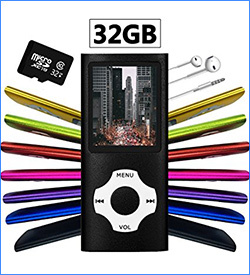 This best-selling MP3 and MP4 player comes in multiple colors to let you purchase one that matches your style. You can use it to view photos, play games, watch videos, and listen to audios. Moreover, the MP3 MP4 player lets you adjust the sound effect into different settings like bass, rock, and classic. 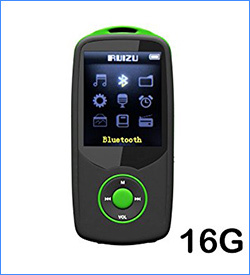 We recommend this player because of it is compact and lightweight, it is easy to use, it has a 16 GB memory, and it supports multiple languages. The only downside is that it lacks an AC adapter. Best for: Low budget people. Like most top rated MP3 players, this G.G Martinsen versatile type comes in multiple colors to let you purchase one that matches your style. You can use it to watch videos, hi-fi recording, or even read an e-book. 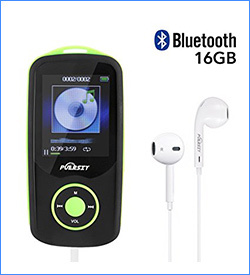 We identify this player as the best MP3 player because of its 16 GB built-in memory, a sound equalizer, an easy to operate multi-language system, its portable size that fits easily into your pocket, and its one-year manufacturer warranty. However, its bonus headphones are not sturdy enough. This is the best Bluetooth MP3 player for sportspeople because it comes with a waterproof silicone case, it is compact in size, and it has a wearable clip to let you carry it with ease. 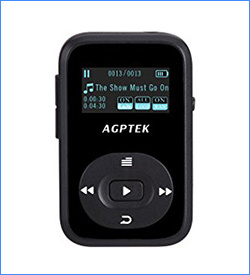 Some of the useful features that make the AGPtek MP3 player the best Bluetooth MP3 player include the Bluetooth function, its 64 GB expandable memory, and the 30 hours run time. However, the MP3 player might not be an option for those who would want to watch videos. Best for: Sports people and anyone with a busy lifestyle. Would you love listening to your favorite tunes while engaged in an activity? Then you might want to purchase the Puersit’s MP3 player. The player is available in blue and green colors giving you the freedom to choose a color that matches your style. Some of the reasons to buy this Bluetooth MP3 player include the 16 GB internal memory that you can expand to 64 GB, its compatibility with most Bluetooth devices, and its one-year manufacturer warranty. Puersit, however, might not be an option for watching videos. Despite being pricey, this AGPtek 16 GB MP3 player comes with many attractive features that will make you wish to own one. Such features include its 128 GB expandable memory, its support for multiple file formats, its sturdy body that has an excellent shock resistant ability, and its ease of use. Furthermore, a 1.5-hour charge lasts up to 30 hours, and it has an armband to hold it tightly around your arm when engaged in an activity. You can use the player for recording, e-book reading, and watching videos. Some of the downside that you might encounter with the player includes the fact that the MP3 player does not work while plugged in to the power and its screen’s poor resolution. 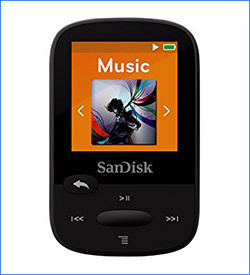 This San Disk MP3 player comes in multiple colors that would be a fit for any style. Some of the features that make SanDisk Clip Sports a good fit for athletes include the can clip that lets you attach the mp3 onto your cloth, a large screen, and its lightweight nature. Like most MP3 players in this list, this brand allows you to watch video clips and listen to your FM radio. Another notable feature is its 25 hours run time. Its downsides include a battery that is not replaceable and being too pricey. 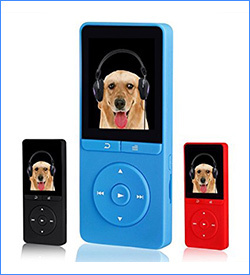 Wyne Technology’s Mini MP3 player comes in multiple colors to let you choose one that pleases you. Some of its top features include the energy saving mode that consumes less power, a high-quality aluminum shell, and the compact size. This MP3 player delivers an excellent run time of 70 hours. You can use Wyne Technology’s MP3 to listen to your favorite radio stations, view e-books and photos, and record audios. It supports multiple languages and its sound equalizing option lets you adjust its sound clarity. However, its screen resolution is poor. 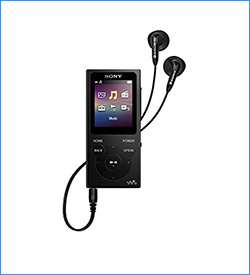 Sony’s best MP3 player for Android lets you watch your favorite video clips, listen to your favorite radio stations, view photos, and use it as a timer. Other attractive features that make this Sony Walkman the best MP3 player include 35 hours run time and its easy file transfer that entails dragging the files from your computer and dropping them into your MP3 player. You may also want to buy this MP3 player because of its quality LCD and the dynamic normalizer that lets you moderate its sound clarity. However, it only has an 8 GB memory. We recommend CFZC as our best MP3 player for audiobooks because of its excellent sound quality. 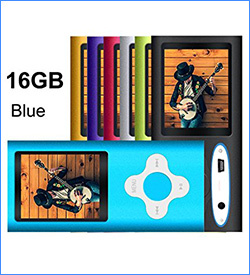 Besides the sound clarity, this 16 GB MP3 player also comes in three colors to help you secure your favorite, its fully charged battery lasts for more than 50 hours, and it supports multiple file formats. This MP3 player is also compatible with most Bluetooth devices, it supports the drag and drop file transfer, and you can use it as a stopwatch, a calendar, or an alarm clock. However, it lacks the playback function. Investing in a good MP3 player is a good way to pass your leisure time as it lets you listen to your favorite audio files, watch video clips, and read e-books. The best MP3 players are easy to use, their batteries last long, and they are sized for portability. 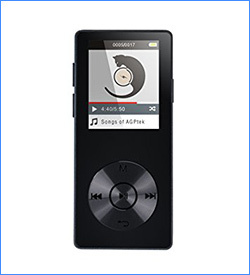 Do you know of another top MP3 player that we have not listed? Share a review to let us try it.